Here’s a simple kettlebell swing program to build strength and power with the one-hand kettlebell swing. I call this the “Equalizer” because you progressively take things up to another level to “equalize” your volume with a heavier kettlebell. It’s a very simple progression – and it works. Check it out. The specific goal is to increase strength of 5 sets of 10/10 with one hand (1H) kettlebell swings (*10/10 means that you do 10 swings on the right, then 10 on the left). Many have found that 5 sets of 10/10 is really the minimal effective dose (MED) of the 1H swing, as it always seems to be an effective rep/set scheme providing you’ve got the correct bell size. 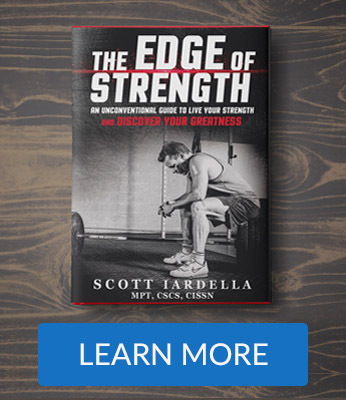 But, how do you effectively progress with the exercise to build strength? This template is a great solution. This progression is different, in terms of frequency and progression, from what Pavel has brilliantly outlined in his great book, Simple and Sinister. The bottom line is that this an effective way to progressively build swing strength. This program was inspired by a reader and fellow kettlebell instructor, Daniel, who wrote about wanting a simple program progression to build strength with the 1H swing. Thanks for the great suggestion Daniel – because this is the simple way I like build swing strength. 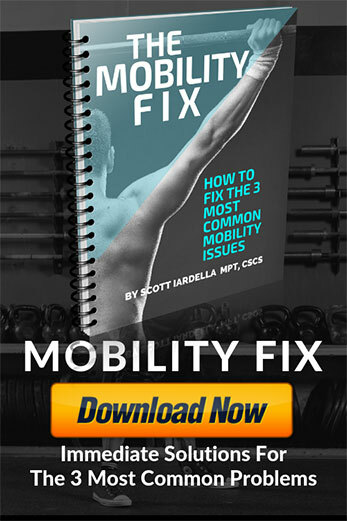 Again, the goal of the program is to build up to a maximal kettlebell size you can perform for 5 sets of 10 with outstanding swing technique. The program is designed to be used as only a part of your training approach. 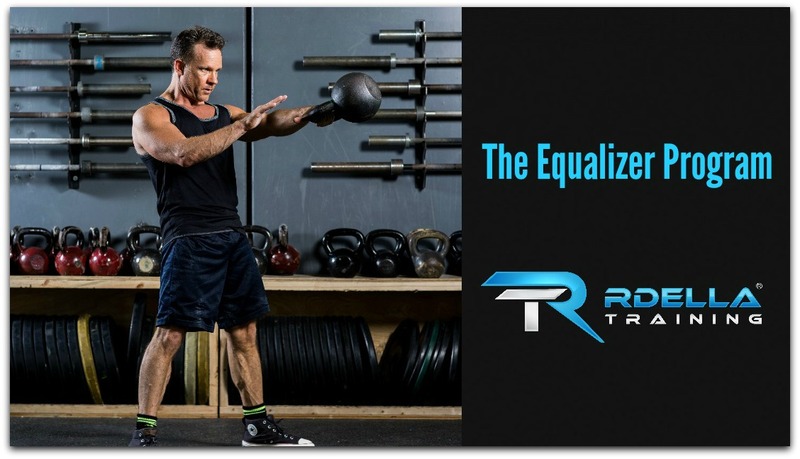 What that means is that you can plug in the “equalizer” into what you are already doing, providing it does not detract from your primary training goal. Make sure the “equalizer” adds to what you’re doing and not subtracts. Here’s the KEY to the program progression. You MUST know the kettlebell size that you can do 5 sets of 10 with outstanding technique. In this example, let’s assume you can do 5 sets of 10/10 with “rock solid” technique with the 24 kg kettlebell. For the program, you will use a 24 kg kettlebell and ONE kettlebell size up which would be a 28 kg kettlebell. This means you use the “heavy” kettlebell first, then drop to your “standard” kettebell size for the remaining sets. Every other session, you progress, except for the last 4 sessions. Through the quick progressions, you ultimately work up to 4 sequential sessions of 5 sets of 10/10 with the heavier kettlebell. Here’s the program over a 4 weeks time period (assuming 3 x week and all sessions done as outlined). Sessions 9-12 are all 10/10 x 5 sets with the heavier kettlebell (one kettlebell size up). The performance goal is the 4 strong sessions with the heavier kettlebell size and outstanding one hand (1H) swing technique. To get the program as a FREE downloadable PDF, click here. If you struggle with a session, repeat the session again next time. The idea is to maintain “outstanding” technique as you build strength. It should feel “easy” as you progress through the sessions, providing you have good baseline conditioning and 1H swing technique. If you want to advance to a higher bell size after the program, repeat the program starting as session 1. Could you do this with a kettlebell size that is 2 bell sizes up from your “standard?” You could, but I’ve found that one bell size up allows you to barely notice the change. It may depend on what else you’re doing with your training, but one kettlebell size up allows for a “creep” effect – meaning you “creep” up the weight slowly and allow the progression to come nice and easy. If you want to specifically build one hand (1H) swing strength, give this simple program a try. And, if you have questions, post them below. 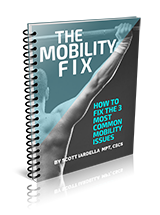 Again, get the FREE PDF here. If you want progress faster, if you’re training 5 days per week for example, you could do the program each day you train by following the progression. This is not how I’ve used it, but it could be a “reasonable” approach. This would move you through the progressions in just over 2 weeks (instead of 4 weeks). If you’re more advanced and want to be more aggressive, then use a bell size that is 2 bell sizes up. For example, if you’re 5 sets of 10/10 bell size is 24 kg, two bell sizes up is the 32 kg. You’ve got options, but I’ve outlined my preference with the program. Can you think of others who can benefit from this program? Let them know about it.